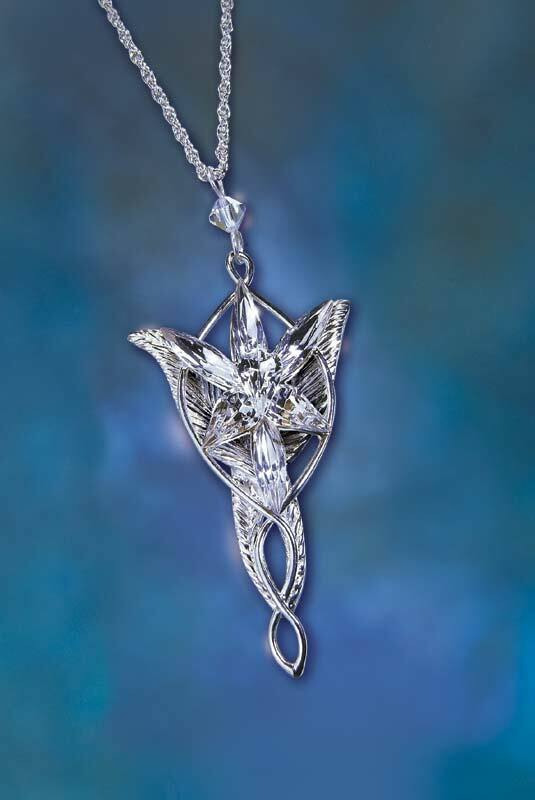 The Evenstar capture the brilliance of the Evenstar's enduring beauty. 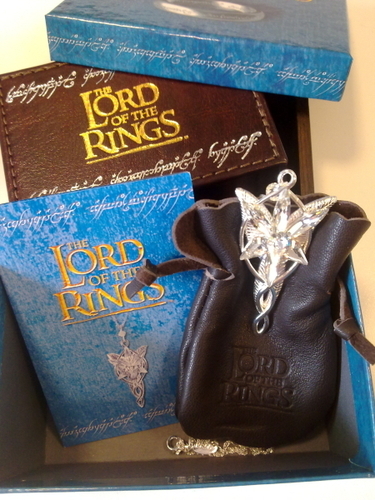 Based on the actual pendant worn in the Lord of the Rings™ film, this piece is crafted in sterling silver. Measures 2 1/2 inches in length and comes complete with chain. The only Elrond's daughter, lord of Rivendell, Arwen was considered the most beautiful being in the Middle Earth. Born as an elf, Arwen chosen to leave the immortality for the love of Aragorn, heir to the throne of Gondor, to whom she gave the marvelous pendant bringing the name of Evenstar with which the same Arwen was known, former of his departure from Rivendell with the Fellowship of the Ring. 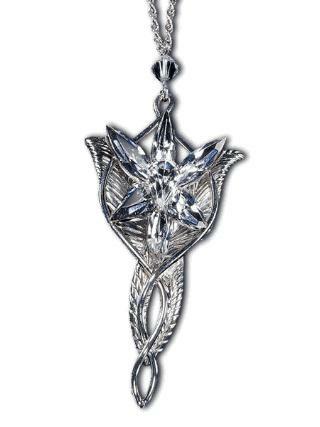 The Arwen pendant is an original creation; it is made in sterling silver 925 (15 grs. ), with Swarowski crystals and provided with a silver chain. Spartan Muscle Cuirass, steel bronze finish, this premium piece of armour is modeled on historical examples. Add a Greek or Roman tunic and a Spartan helmet and the panoply will be complete. Replica of an original, Late Roman Pugio "Kunzing" Type, late Roman dagger found in the Roman fort near Künzing (Bavaria) dated from the 3rd century AD. Greek corinthian helmet typical of the fifth century BC paragnatidi fixed and nasal, common in southern Italy following the Greek colonies. Helmet from Spanish Horse, heyday of the Iberian kingdom that is reflected in the subsequent manufacture of weapons and armor. Wearable Medieval Armor: typical italian-style man-at-arms suit of armor of the second half of the XVth century made in Lombardy, centres in the armor's manufacturing. Girl porcelain figurine, Porcelain sculpture depicting a young girl, Amelia, height 8.27 in (21 cm), Wonderful porcelain sculpture, entirely handmade in Italy. Helmet Spanish horse, characterized by large-billed visor which covers the entire face, exposing only the slots for the eyes. Lorica Segmented, Typ Corbridge A, Roman armor developed since the first century AD and worn by legionnaires in place of chain mail or lorica hamata.